Roger Rolls - World No. 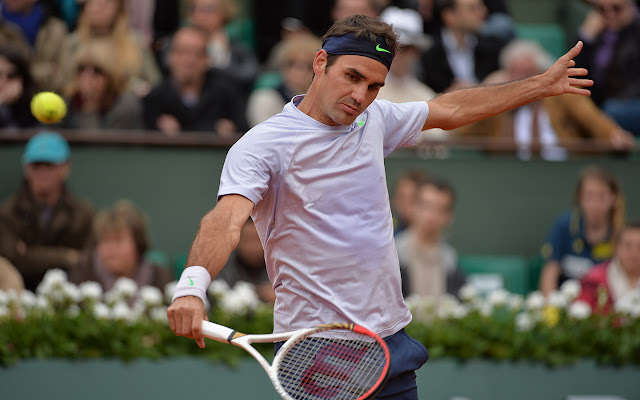 3 Roger Federer coasted past a potential challenge from Pablo Carreno-Busta, launching his Roland Garros campaign with a rather routine 6-2, 6-2, 6-3 win. Coming into today's meeting with the all-time major champion, the Spaniard was the reigning King of the Futures, having amassed a 39-1 record on the lower-level circuit this year including a 25-0 run on clay. His success at lower levels encouraged some prognosticators to assume he would give the Swiss an early test. Federer, on the other hand, indeed proved that the future is not now, not yet at least. The Swiss master won 83% of his first serve points and going 7-for-7 on break points. Long story short, Federer blitzed the Barcelona native in a miserly 80 minutes as if he had lunch reservations at L'Entrecote. Federer will face another less-heralded qualifier in his second round match, 28 year old Somdev Devvarman of India. Federer won their first meeting back in 2011 and he'll be heavily favored to double up. Out Of Gas - Lleyton Hewitt is 32 years old and unlike Federer, who's just a few months younger, Hewitt is over a decade removed from his last major title. He's also without a win of any sort at Roland Garros since 2010. The Aussie Battler wasn't given an easy road to reversing that streak, but early on, it didn't seem to matter. He jumped out up two sets to love over 15th seeded Frenchman Gilles Simon. To paraphrase Louis XIV, "Apres ca, la deluge." Hewitt needed just 66 minutes to claim the first two sets of the match, but a bit over two hours later, in a stunning turnaround, it was Gilles Simon moving on, 3-6, 1-6, 6-4, 6-1, 7-5. Simon wasn't exactly playing his best tennis, telling the press "my forehand was catastrophic, but I'm going to try to solve that," but it was enough on the day. The famously fiery Hewitt seems to have mellowed and was gracious in defeat, "You know, would've liked to have been on the other end of it. Disappointing, but he's a quality player." We wonder if it's Hewitt's last tango in Paris, given his age, injury troubles and lack of success of late on the biggest stages (he's only been in the second week of a major once since 2006), but if we know Hewitt, he won't give up the fight until he does so his terms. 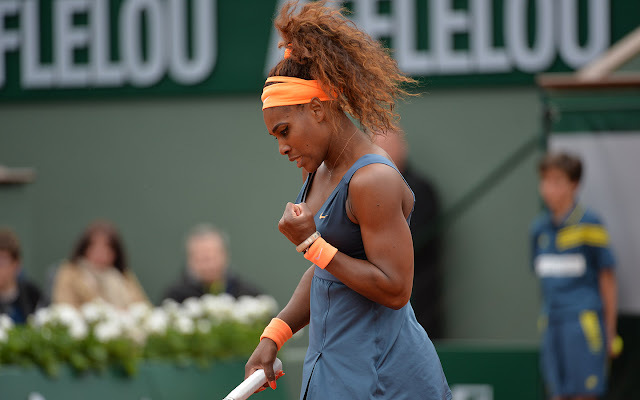 Serena Exorcises RG 2012 - One player at Roland Garros not looking back on their glory days is WTA No. 1 Serena Williams. She came on court today with a simple mission, to exorcise the demons of a shocking meltdown a year ago. She did so with a devastating 6-0, 6-1, 51 minute demolition of Georgia's Anna Tatishvili. How devastating? Tatishvili hit a grand total of zero winners in the first set, a set which lasted a grand total of 20 minutes. She raised that number infinitely to four winners in the 31-minute second set. Williams, on the other hand, fired 27 total winners past her severely outmatched opponent and nullified any lingering nerves from a year ago. "I was nervous - I'm always a little nervous going into first round matches at Slams," Williams said. "This time I wasn't as nervous as I was at other Grand Slams, though. But for the most part I felt pretty safe and felt good about my game." She didn't show those nerves show and now she's got even less reason to worry, she's now notched her best performance at Roland Garros since 2010. Serena's biggest threat, the lady in the mirror? Mmm-hmm. Go walking for the untamed facet using zebra for you to snake skin color patterns. Select the top handbag for ones employment so that you can absolutely jump out by simply deciding on a lean carry which has a reliable coloring system design and style. cartier replica sale These kind of specially ooze elegant along with professionalism and trust which has a cash S, & allows you to be with the level involving fashion & quality. fake watches uk Turbocharge that will visual appeal by simply picking a new designed fashion! chanel replica Every time it can be hand bags, or possibly, clutches normally, you would like, and then check out in this article to the biggest selection, & for ones personalized favourite trademarks! fake chanel Quite often they can't have a very securer. A new carry handbag is often a cool types of holding your individual requirements. hublot replica Lots of varieties along with forms produce a new carry handbag the optimal associate pertaining to at work costume. replica prada Very easy change lives which variety carry you are thinking about, an entire number of varieties & habits think you are presented. accept to be equally valuable.